Verta Maloney has worked for more than 20 years in education as a leadership coach, principal, and educator. She currently works with school teams to facilitate conversations around race in education. Most recently, Verta was the Director of Leadership and Learning at Unbounded, an organization that provides standards-aligned resources and support in the classroom. 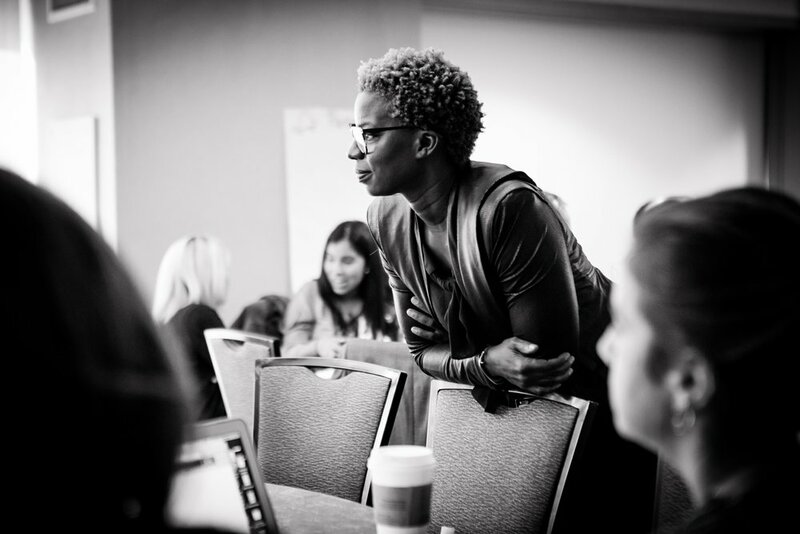 Previously, Verta was the Managing Director of Programs for the New York City team of the national nonprofit New Leaders, the Managing Director of Student Learning and Achievement for Public Prep, and taught elementary and middle school students in Maryland and Washington, D.C. Thriving Schools: Verta, today we’re going to be discussing a number of issues regarding race in education. Given all the effort we’ve put into inclusion and diversity programs over the last few decades, why aren’t we seeing better outcomes? Verta: I think there are two core problems. The first is that we don’t center these conversations and programs on race. We have to realize that because we’re in America, race and racism are at the foundation of many of our systems. And we have to talk about and acknowledge that. The second problem (that stems from the first) is that we try to fix people or curriculums, rather than the systems that oppress and marginalize. Let me give you an example. Some schools decide that they want to bring in a culturally relevant curriculum to address their problems around race and diversity. But I think an approach like this won’t work if the teachers who are delivering it haven’t had the necessary conversations and time to explore the biases they’re bringing into the classroom. Thriving Schools: Okay, so let’s dig in! When a school decides that having an honest dialogue on race is a priority, what are a few of the things they should be thinking about? Verta: I think the very first one is deciding that this is going to be a priority and a commitment. It can’t be something that we just give lip service to. The next thing is that school leadership needs to be intimately involved and the mouthpiece for these conversations. This means being vulnerable with your team and sharing your own journey with race and racism. And the last part I’ll mention is focus. And by that I mean you’re going to have teachers who say this is too political or this doesn’t have anything to do with my subject. As hard as it may seem, you need to start by focusing your time and attention on the faculty members who are willing to engage in these conversations. "Everyone has something regarding race that’s happened to them. And we’re not here to judge that. It just is. But because of our personal stories, we need to realize we bring certain biases, identities, and frameworks with us into the classroom." Thriving Schools: Verta, you’ve helped so many schools think about and process race and racism. Where’s the best place for a school to begin – amongst staff, between school leaders and teachers, or with teachers engaging their students? Verta: I think it’s all of the above, depending of course, on where your team is at (and given your school’s context). For instance, some teachers may not be ready to engage their students in these conversations. And I’m a big fan of making sure we “do no harm.” If you’re an adult who isn’t ready to have these conversations with other adults, this could end up being really damaging for students. Again, it’s about knowing your context – there are some schools who’ve done a lot of work around this and some who have never talked about it. If you’ve never talked about race as a staff, how are you going to take any responsible message into the classroom? Thriving Schools: Ok, let’s start with a school team that’s never broached the topic of race together. What are their first steps? Verta: I think a great place to begin is by having an honest look at your school’s culture and environment – getting a sense of what’s going on. You can then look at suspension data, student achievement scores, and demographics to get a sense of what’s going well and what isn’t. You can also look at your curriculum and examine who’s being represented and whether your community is reflected in it. Thriving Schools: Where do you go next? Verta: What I like to do from there is to get really local. I will work with a school team and have everyone think about and share their own stories around race. These are really courageous conversations and there are a lot of terms for going through this process (e.g. racial histories or biographies). We’ll take the time and think about questions like – when is the first time when you noticed or experienced race? Everyone can identify that, especially in this country. And by sharing responses to this question (and many others), you realize everyone has something regarding race that’s happened to them. And we’re not here to judge that. It just is. But because of our personal stories, we need to realize we bring certain biases, identities and frameworks with us into the classroom. Thriving Schools: It must be very powerful for teachers to recount their formative experiences around race, especially when they realize their students are having these same experiences now. What’s next? Verta: From there, you can take these very personal experiences and start talking about how we define terms like “race,” “equity,” and “diversity.” The reason this is important is because if I say, “imagine a tree,” everyone’s going to come up with a different vision in their head – maybe it’s an evergreen, a pine, or a willow. The point is that we’re all seeing trees, but they’re not the same. Likewise, if we’re working together as a school team, we need to be clear on what we mean when we say race, equity, and diversity. Thriving Schools: After going through these steps, what would you recommend? Verta: Well, it’s not until you’ve done these things – thinking about your personal experiences regarding race and coming up with a team agreement on how to define terms – that you can move on and talk about how you can improve your school climate. And keep in mind, where school teams decide to go from here is going to look very different. But what I will say is that whatever you decide, you should respect that decision. For example, let’s say you decide that the texts you select for students should represent lots of different peoples and viewpoints. So we decide that. But if you go into classrooms and don’t see it and don’t say something about not seeing it, then who cares? You don’t respect that decision and you don’t care about what your team discussed together. Thriving Schools: Previously, you mentioned how important it is to define certain terms as a team. But I think we’d both agree how limiting language can be. Do you think we should spend more time developing and defining our identities or pushing past these limits to recognize and respect the common humanity we share? Verta: To me, it’s about honoring both. Getting back to our forest analogy . . . Yes, all trees need water to survive and they have that in common. But they need different amounts. And they need different amounts of shade. The same idea applies here. So I think the ideal middle ground is honoring the things that make us different and that bring us together. And that’s another benefit of doing these stories together as a team. You’ll see so many similarities in how your team has experienced race, but also realize that the stories are completely different (and have completely different outcomes). Thriving Schools: Verta, to wrap up this first part of our conversation, what resource suggestions would you have for educators wanting to dig into these issues further? 3. Malcolm Gladwell’s Revisionist History. 3. A Conversation about Race – this one’s from the New York Times which also provides educators some really great ideas on how to talk about race with students. 4. Raising Race Conscious Children, cofounded by Lori Riddick, is another organization/website that is pretty awesome and doing great work.